Rhinoceros is a play about the inhabitants of a small French town. It seems like a quiet, sleepy place – reminiscent of Trumpton – with a square, a local fire brigade, and offices. Over the three act no interval play, the audience watch the inhabitants adapt to changing circumstances as an epidemic of rhinoceritis overtakes the townspeople. Bérenger is the central character and plays the common man. As the play begins, he is being scolded for his drunkenness by a friend when the appearance of a rhinoceros interrupts them. Soon other rhinos are spotted, and one tragically tramples a local cat. It’s in the paper in black and white … It’s in the Dead Cats column, you can’t deny that. Confusion reigns. While there might have been more pertinent questions to ask, the cast are soon debating the type of rhinoceroses that they’ve seen – one horn or two horn … and even whether it could have been a unicorn! The appearance of The Logician further muddies their response to the dangerous epidemic. As the play progresses, more and more people are afflicted and transform into rhinoceroses with the application of lashings of green greasepaint. A cross between the Incredible Hulk and The Fly with added moments of slapstick and infectious giggling that spreads throughout the theatre when a character jumps out a window. The modular set is simple but effective, with fabric covered panels forming the shape of the town’s houses, and forming windows which superbly frame the talented cast of five. Sion Dey’s haunting score subtly signals off-stage rhinoceros behaviour. Eugène Ionesco’s 1969 play examines how we react to new and fearful conditions and philosophies. While we can sometimes agree about the new enemy, we spend longer categorising and explaining it than figuring out how to stand up and resist. We accuse others of intolerance. I think you’re right to have some reaction, but you go too far. We question what is propaganda and what is truth. We ignore the elephant rhinoceros in the room and become complacent. Rhinos are living creatures, with as much right to life as the rest of us. Soon some will become comfortable with the oppressor or the conflicting ideology, excusing or even joining the new movement. [We can] build a life on new foundations. And the blame shifts from the oppressor to the oppressed. Maybe it’s our own fault. So far, so good. However, the Paris-based company Theatraverse have added another twist to Ionesco’s already absurdist play. Many of the characters deliver their lines in French, the remainder in English. This doesn’t affect the on-set characters (who seem confidently bi-lingual) but it does cloud the understanding of the audience. The Belfast Festival programmers assured audiences that “Does not require French to enjoy”. I beg to differ. My rusty school-boy French allowed me to pick out snippets of the dialogue, but far too slowly to keep up with the cast. At least two thirds of the dialogue was in French. And the delivery of some of the English lines was indistinct. Without French I could certainly follow the plot and understand the dynamics of each scene. However, I was left wondering why nearly Francophones were laughing at French dialogue, and missed a lot of the detail including Bérenger’s final lines which explain the rational of his final decision. It’s like two-thirds of the subtitles failing on a foreign film. It makes me want to read a copy of the play to discover what I missed. At only an hour and forty minutes long I wouldn’t dissuade you from picking up a ticket to attend Saturday or Sunday night’s performances. (There’s a post show talk with the cast on Sunday.) 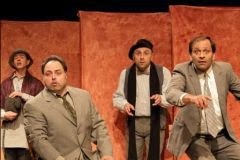 However, by adapting Ionesco’s play and mixing languages, Theatraverse have deformed the work and created a much more complicated, multi-layered work. For me, the inaccessibility and supplementary confusion ended up detracting rather than enhancing Rhinoceros. The last week of November is shaping up to be a week of political hustings and community discussions. Looking towards the final stages of the Haass/O’Sullivan talks, Platform for Change are hosting a panel discussion in Dukes at Queens (aka, Dukes Hotel) on Monday 25 November from 7.30pm to 9.30pm. After a fraught summer of rioting and recent murders, against a backdrop of political impasse since the decision by the first minister to abrogate the deal on the future of the Maze prison site, the Americans are back to try to resolve the issues dividing the parties in command of Northern Ireland’s increasingly dysfunctional power-sharing system. Trevor Ringland (former Irish rugby international) will chair. 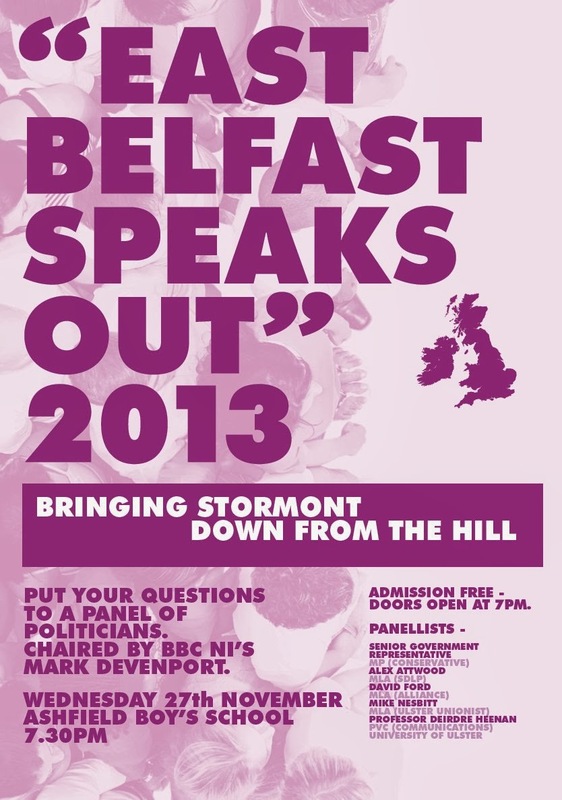 Later that week East Belfast Speaks Out is back again in Ashfield Boys School on Wednesday 27 November. 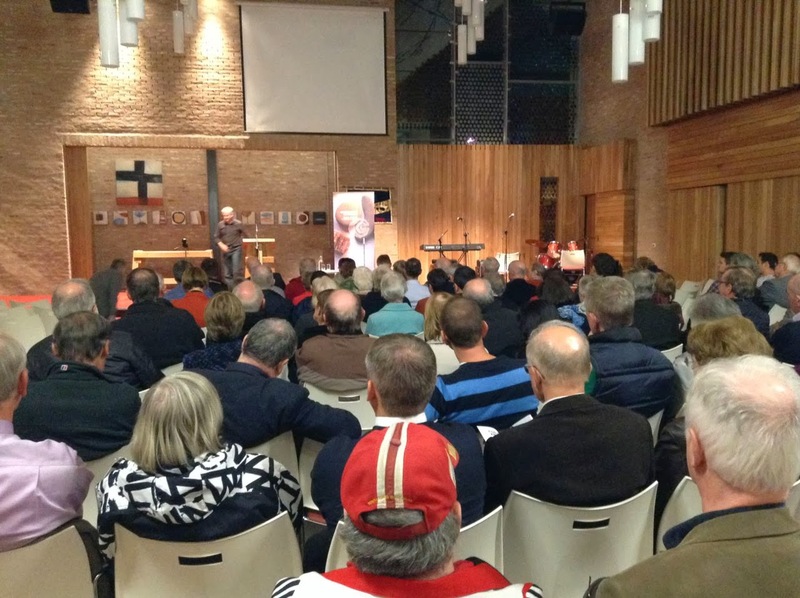 In its first three years, the community hustings has attracted audiences of 400 to the school hall and featured featured DUP and Sinn Fein politicians as well as government/opposition ministers. Peter Robinson and Martin McGuinness made a rare appearance as MLAs together on a panel in 2010. This year the largest executive bedfellows are being rested and other parties given a chance. Mark Devenport is back in the chair and will hopefully repeat the model from previous years which allowed a large range of questions – local and ‘national’ – to be covered by the panel. Doors open at 7pm for a 7.30pm start. September 2009 – Patrick Corrigan (Amnesty), Jeffrey Donaldson (DUP), Gerry Kelly (Sinn Féin), Naomi Long (Alliance), Laurence Robertson (Conservative). Mark Devenport chaired. November 2010 – Liam Clarke (journalist and commentator), Martin McGuinness (Sinn Fein), Dawn Purvis (independent), Peter Robinson (DUP), Hugo Swire (Conservative). Mark Devenport chaired. February 2012 (postponed from November 2011) – Michael Copeland (UUP), Sammy Douglas (DUP), John Kyle (PUP), Chris Lyttle (Alliance), John O'Dowd (Sinn Féin). Conor Bradford chaired. Both events are open to the public and free to attend. But Sunday night’s performance by PianOrquestra in QUB’s Sonic Arts Research Centre (part of the Belfast Festival and the outcome of a British Council creative partnership between UK and Brazil) was an altogether more pleasant and tuneful affair. The ten piece programme was based around four of John Cage’s Sonatas and Interludes using a “prepared” piano and a saxophone. 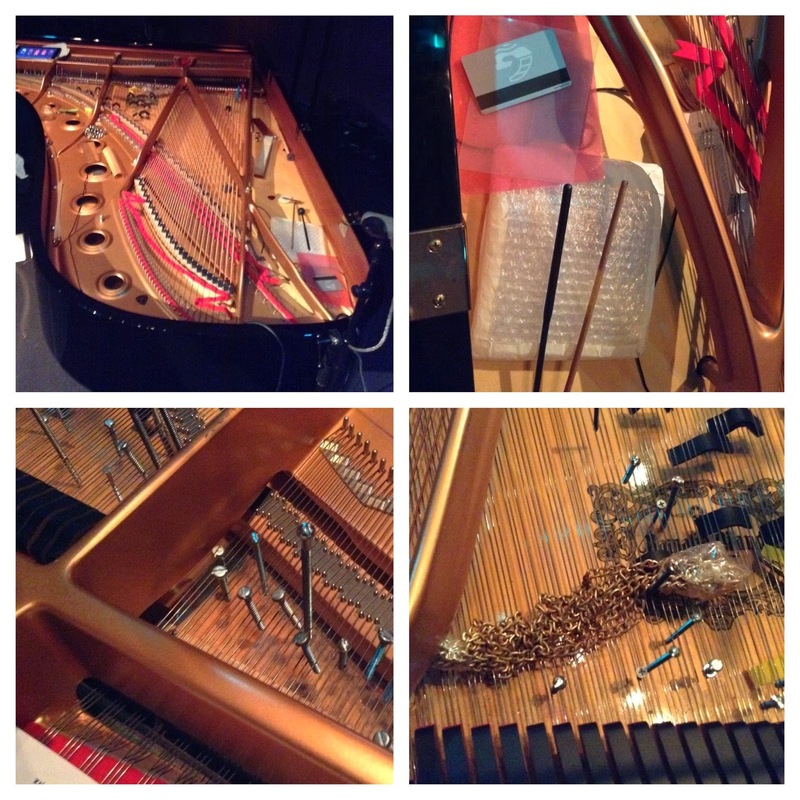 In the musical score, John Cage specifies the alterations necessary to prepare a piano for the performance. Different lengths of screws and bolts need to be placed at different depths between particular strings along with strategically positioned pieces of rubber, plastic and a rubber. The effect is to distort the piano’s natural tone, often creating a sharper metallic sound, with the soft pedal used to further vary the instrument’s output. Despite all this DIY, many of the notes still sound like a familiar piano – so the while the tune is disguised and unexpected, the sound isn’t so alien that you can’t follow the music. Here's a sample from one piece. Alongside John Cage’s Sonatas, the Brazilian group performed works by and with SARC’s own Prof Pedro Rebelo and Justin Lang. Earle Brown’s short piece December 1952 was performed three times during the one act programme. Each player interpreted Brown’s alternative music notation – horizontal and vertical lines varying in width, spread out over the page – in a different way, creating three remarkable unique pieces. As one or more players would “play” the piano – some at the keyboard, others picking strings, dragging wood or rubber over strings – a large screen would often show the score. 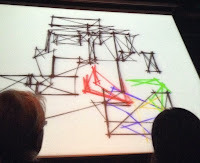 During the penultimate piece – Perk, a composition by PianOrquestra themselves – a camera mouted on the camera showed the many hands at work creating the sound, darting back and forward across the strings. While the final item aRound Cage proved to be the largest auditory sensation – with SARCs surround speaker system (above and below as well as all around) put to good use – Justin Yang’s Webwork was perhaps the most involving. 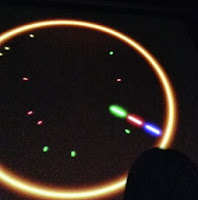 A little like an arcade or Wii dance game, short coloured lines moved clockwise inside a circle on the screen, a little like a clock. As each player’s line passed over another object in its way, the appropriate musician would play something. The audience followed the score on our big screen at the same time as the players craned their necks to watch their monitor. With variation in the speed of each player’s line and the kind of shapes they passed over, the music morphed and adapted. And afterwards we discovered that Justin Yang was controlling and changing the flow in real time, simultaneously conducting and composing. 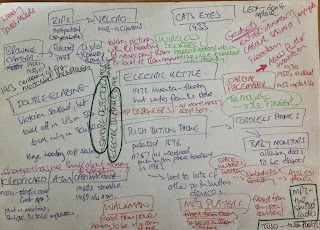 The hour long programme was a fascinating insight into alternative musical notations as well as an education into the sounds you can get out of a piano if you’ve two hours and a few pounds well spent in your local hardware shop! You never know, maybe PianOrquestra will be called up to play at the opening night of the Rio 2016 Olympic Games! I spoke to Pedro Rebelo afterwards about the performance, the piano and experimental music. New media and new politics in NI? Or complacency after conflict? Topics covered included whether NI actually wanted to change, whether anyone could think of an example of social media influencing politics in NI, and looking at groups, parties and campaigns (eg, Platform for Change, Occupy Belfast, NI21, LADFLEG, Hope and History) that have mostly failed to use social media effectively. You can listen back in three parts. Addressing the seminar’s title … New politics has to stand for a lot more than two political parties agreeing to cooperate in private and fall out in public (unless G8 leaders or US business reps are over). In terms of democratic renewal and popular participation, I only see some very limited evidence that any kind of new politics in infiltrating society. New media. If we think about social media for a minute. Sure Adams, McGuinness and Robinson are all on Twitter. But knowing about Snowy the dog, and laughing at the First Minister falling into his fish pond during an election campaign isn’t going to win many votes. Neither has social media brought down Adams or Robinson, though it may have swung a presidential election once picked up and repeated by the traditional media. The DUP’s Jim Wells once quipped that the Facebook limit of 5,000 friends equated to a good quota. He saw the potential to connect with people in your distract to constituency, to “groom” them (not the phrase he used!) to turn out and vote. But no evidence that social media in itself encourages people to walk out of their front door and travel to a polling station. Around 50% of the DUP’s constituency work now comes via Facebook. We can read books and papers about revolution outside Northern Ireland and look at the role of new media in organising, reporting and monitoring citizen-led action. The bloggers around the table should be under no illusion that while we’re obsessing about the political and socioeconomic machinations and whispering in the ears of blog readers, we’re not actively changing much. We’re not “the people”. Occupy Belfast had a campsite in Writers’ Square opposite St Anne’s Cathedral and later walked into a long-vacated Art Deco bank building. A hotchpotch of socialists who were internally focussed and did little to reach out. Lacked imagination. Ended when “a radio flung from the building at around noon narrowly missed a woman and young child on the pavement below”. The police entered the building and a few hours later ushered out the movement. At one point while one occupier was being interviewed on the Nolan radio show, another phoned in from the same building to contradict him. Jamie Bryson, Willie Frazer and friends. They represented “the people”. While not always singing from the same hymnsheet and not always sharing objectives, it was obvious that “the people” which seemed to be the “goddess of structurelessness” was actually organised by an “exclusive friendship network”. Pre-existing networks assembled. Appropriate perhaps that Jamie Bryson and Willie Frazer ended up sharing a cell for a few days or weeks. The “movement” didn’t grow from nothing online out of the #flegs hashtag. They grew out of Orange Halls, bands, loyalist bars. Facebook groups helped the urban protesters organise, and Facebook in general provided a forum for venting their anger and retaliating against anyone who questioned or condemned. And online gave Jamie Bryson a voice, if not a listening audience. The flag protests were the closest thing Northern Ireland has had to proper flash mobs. And loyalism has been set free to express its anger and identity online. For me one of the most intriguing innovations to come out of the flags protests was the picture of the collated schedule of protests with times and venues up to a week in advance that was circulated by someone every day. A decentralised secretarial service, and a huge public service for commuters. Without new media we’d still have had flags protests. The difference would have been longer queues of traffic. In the Middle East, reporting through traditional media is stymied by blocking satellite uplinks and trying to throwing the switch to darken the internet. The nearest we have in Northern Ireland are the constant attacks on Loyalism Against Democracy’s LADFLEG Facebook accounts. LADFLEG is a loyalist parody site. At times hilarious caricature and lampooning of utterances and acts carried out in the name of loyalism, and more recently, crossing the difficult to see line into attack and viciousness. I’ve lost count but I think they’re on their sixth Facebook account – once enough people report them, Facebook seem to suspend the account. Not sure Facebook’s Irish presence is taking much notice of the north! Dave Magee @dgmagee has written about it as has Brian. While the jury is out they have successfully opened up further understanding of their community. When Gerry Kelly took a lift on a PSNI landrover, Sinn Fein had filmed the incident and published it online. They would have wanted to draw attention to the PSNI’s reaction: instead, they also drew attention to Gerry Kelly’s own aggression. Flags did bring the Harriet Long’s blog to greater attention, well argued opinions and an insight into working class loyalist East Belfast. So any signs of democratic renewal or popular participation? NI21 are one to watch. A new pro-Union party set up by Basil McCrea and John McCallister. They’re appealing to the middle class Facebook generation who are disaffected by politics. Their challenge is to convert “online Like” into “real world Vote”. They put out a video about Respect for Flags a couple of weeks ago. It didn’t go viral and they must be disappointed with just 2,202 views [accurate this morning]. With a statement about humility, healing and hope, the Hope and History campaign was set up by a handful of Christians, mostly clerics. It borrowed its name from the words in a poem by the just-deceased Seamus Heaney (The Cure at Troy) and was in response to Richard Haass arriving and an appeal for leaders and communities to seek the common good. History says, don’t hope // On this side of the grave. Of justice can rise up, // And hope and history rhyme. A small-scale unsustained flash-in-a-pan campaign which collected 1,500 signatures online in September (and 50 so far in October). Plotting the number of signatures collected each day on a graph, it peaked on day two, rallied after church on the Sunday, and then fell away. [In the question session afterwards I also highlighted the contributions to QUB’s Compromise After Conflict blog, with recent pieces by Jamie Bryson (a coherent and well argued post) and Martin McGuinness. Though in later discussions while reflecting on Alex Kane’s question of whether Northern Ireland actually wanted change, I wondered whether the blog should have been titled Complacency After Conflict. "Let the church be the church: the face of forgiveness and mercy. 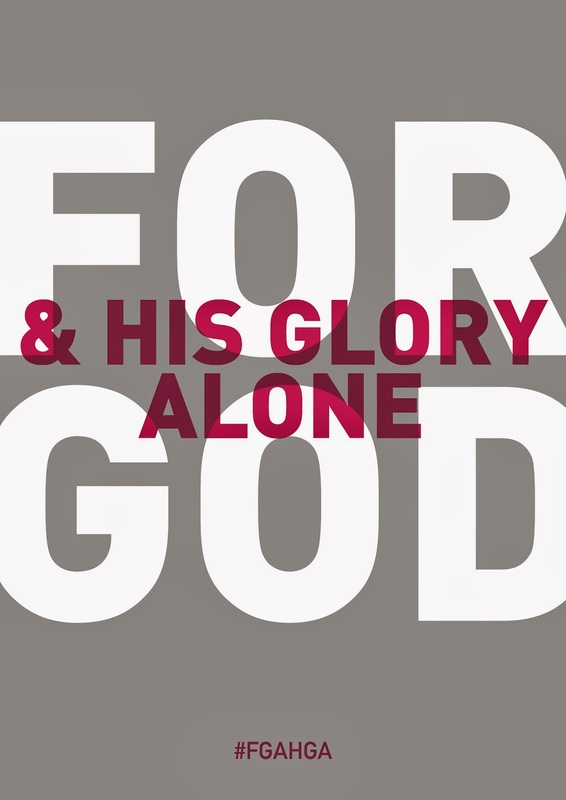 No one else can be, it's our only gift to give"
Last night's well attended lecture by David Porter started by looking back at the circumstances that had influenced the writing and publication of For God And His Glory Alone. Update - Gladys Ganiel's report on the lecture also unpacks its implications - well worth reading and digesting. In fact, stop reading this post, and read her one instead! David Porter picked up on Prof John Brewer's "uncomfortable truth" when he questioned: Are the churches capable of doing anything anymore, even if they wanted to? Each generation needs to lay aside the lure of our ancestral voices. We "de-story" other people's experiences; we have a "mutual antipathy to each other's stories" that wins out over "our shared story of faith". This contrasts with the "invitation to salvation which is an invitation to re-narate our story and align our story with the upside-down kingdom in which the king rides on a donkey and washes other people's feet. The audience was reminded that Gordon Wilson's expression of "forgiveness" at the time of the Enniskillen bomb which killed his daughter seemed to some as being what the Gospel was about, yet to other Christians this this forgiveness was publicly questioned. "Let the church be the church: the face of forgiveness and mercy. No one else can be, it's our only gift to give." Heather Morris responded to the fifty minute lecture, picking up on some of the themes and calling out challenges to Northern Ireland faith communities. They’re all fighting over religion. Sure Christians are part of the problem. 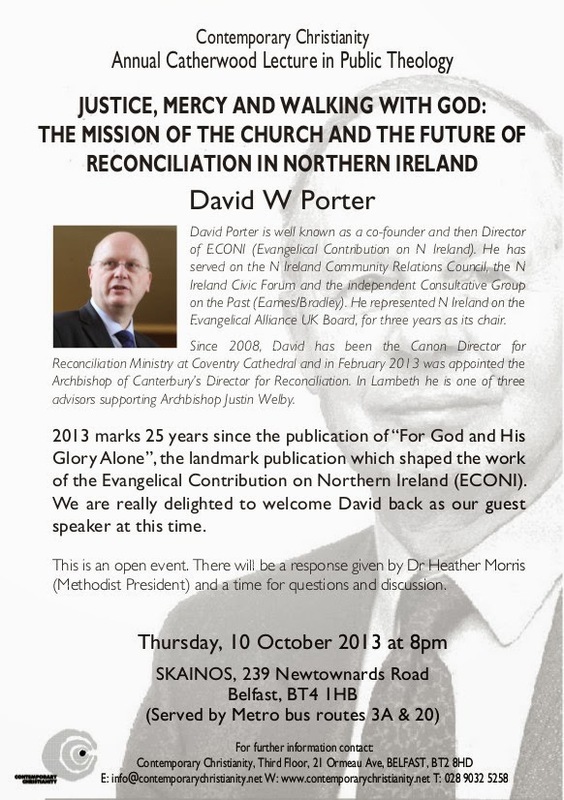 Twenty five years ago a group of Northern Ireland evangelicals decided to address the possibility that Northern Ireland Christians could do more to be actively part of the solution. They published For God and His Glory Alone – deliberately mirroring For God and Ulster – and challenged Christians to think differently about how they might live Biblically and contribute positively to a society that was still far from peace. … it pulled evangelicals out of individual salvation and out of concerns for the church and maybe out of concern for their denomination and took their concerns into the public square and said: what do these Biblical principles mean as they work themselves out in the specifics of Northern Ireland? The short booklet looked at love, forgiveness, reconciliation, peace, citizenship, truth, servanthood, justice and righteousness, hope, and repentance. Love … is to be pre-eminent in the church, and is to be evident in our relationships with our neighbours, irrespective of their culture, religion and background. Distinctively, followers of Jesus are told to love their enemies. Justice & Righteousness … A healthy community is one in which the human rights of each individual are protected. In this context, the Christian ethic is not a defence of “my rights” but a concern for the rights of my neighbour. God’s concern is expressed specifically for outsides, the poor and those without power. Between 1988 and today, ECONI has morphed into Contemporary Christianity, and is still working to understand and articulate how Biblical principles apply to life in Northern Ireland and beyond. Twenty-five years on, Northern Ireland is on the other side of the peace-process, and yet has a long way to run before we are at peace with our past and our future. The principles in the booklet and their application still seem appropriate to how churches and their members act in 2013. To an extent our politics have moved on, but have our churches and day-to-day faith? The booklet has been republished and is being relaunched on Thursday morning at 10.30am at Skainos (39 Newtownards Road, Belfast). Some of two hundred people who co-signed the original will be present, offering it as a continuing contribution. The full text is available online as well as in print at tomorrow’s launch. Gladys Ganiel has some thoughts on the relaunch over on her blog. The launch will be followed in the evening by the annual Catherwood Lecture. Last year Johnston McMaster spoke about Signing up to the Covenant: An Alternative Vision for the Future? Previous years have looked at contemporary art and even featured an HBOS whistle blower Paul Moore. Tomorrow evening, back in Skainos at 8pm, ECONI’s co-founder and former director David Porter – now the Archbishop of Canterbury’s director for reconciliation and a Canon for reconciliation at Coventry Cathedral and was part of the “Eames/Bradley” Consultative Group on the Past – will speak about Justice, Mercy and Walking with God: The mission of the church and the future of reconciliation in Northern Ireland. Both the launch and the lecture are free. 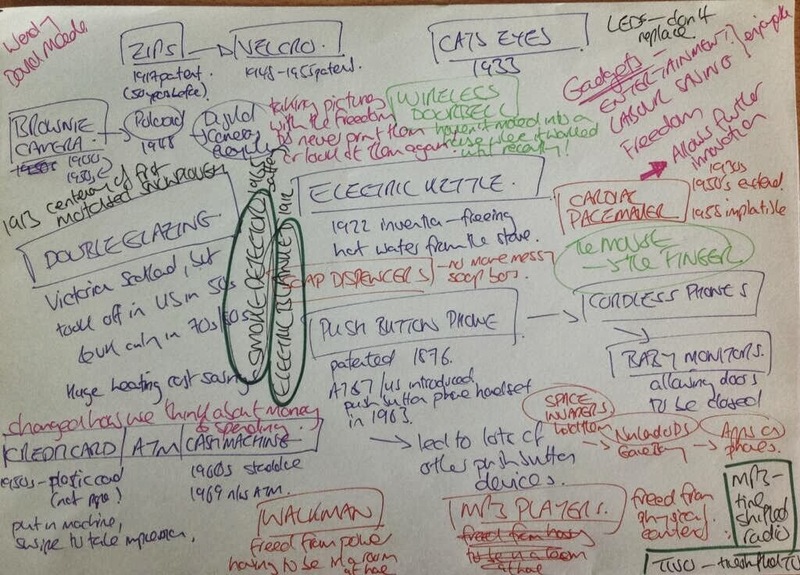 What's your favourite gadget from the last 100 years? The best invention or physical innovation? A lot of the gadgets that immediately come to mind fell into the category of entertainment. Yet the ones that make most impact are those that are labour saving. Many early inventions have opened up the possibilities for further innovation. A Channel 5 Gadget Show survey found zips to be the number one gadget. (Patented in 1917, though invented fifty years before.) Via the burr, zips have morphed into another fastener: Velcro, the zipperless zip. smoke detectors (lower cost battery models only started to become available in 1965): saving lives with radioisotopes screwed to your ceiling. the Mouse … which is slowly being replaced with the Finger! I wonder if Talkback could cope if the digital clock hadn’t been invented? The four shortlisted artists for the 2013 Turner Prize will be exhibiting in Derry from 23 October until early 2014. We spent a fun afternoon at the Ulster Museum today finding out about this year’s nominees as well as previous winners. Laure Prouvost’s work varies from film to surreal installations to misspelt signage. Her installations draw in audiences who are trying to figure out the story behind her work. in the audience stories, translation, and surreal moments. Tino Sehgal specialises in artworks that involve real-life encounters as well as obtuseness. Since he shuns his artwork being captured on film it will be hard to convince you of the cleverness of the large scale situational choreography and the themes and messages behind his work. Humour – and satire – pervade David Shrigley’s stick drawings, stuffed animals and objects. 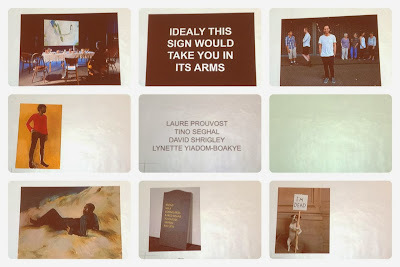 Accessible and funny enough to make me laugh out loud (a rare event) means David Shrigley gets my vote to be the winner. Lynette Yiadom-Boakye paints people, from memory rather than from photographs or at long live sittings. While portraiture is well-established in the art world, her focus on black subjects makes her work stand out. Some subjects appear in multiple paintings. Apparently the more of her work you see, the more the themes and style emerges. Parked outside the Ulster Museum’s front door, the REACT mobile home had been turned into a studio for Seamus Ryan to capture the facial reactions of visitors when they were shown Turner Prize works. The REACT crew have already been busy at the University of Ulster Belfast campus, Armagh, Enniskillen and today at the Ulster Museum. Photographs will go online at the Turner Prize 2013 website. Folk from Derry may also find their reactions appearing on gable walls and poster sites around the city. The four short-listed artists will exhibit in Ebrington from 23 October to 5 January. The 2013 winner will be announced on 2 December. Festivals of music, theatre, books and now words. Libraries NI have launched a Festival of Words featuring authors, poets, story tellers, actors and reviewers in a series of events scattered across their network of libraries. Running from 2 to 31 October, there are twenty three events in nineteen libraries. On Tuesday 15 October at 8pm you can join a panel discussing the Man Booker Prize shortlist in Derry Central Library before watching the live announcement of the 2013 winner. Or on Thursday 17 October at 7.30pm, listen to storyteller Liz Weir with City Tales in Belfast Central Library. Stories from Shakespeare and Austen classics will be dramatized in Portadown Library on Wednesday 23 October at 7pm. Frances Quinn will be bilingually relating yarns in the Falls Road Library on Thursday 24 October at 7pm. Those with little or no Irish – and presumably, those with little or no English – will be able to take part. Half an hour earlier at 6.30pm over in the Shankhill Road Library, a workshop will outline the background to Ulster Scots and give a flavour of poetry and storytelling in Ullans. Libraries regularly host readings, book groups, talks and even piano open hours which are still running monthly in Lisburn library! Details of lots more events including those in the festival at the Libraries NI website … or call into your local library. TeachMeet Belfast is back in Belfast on Friday 18 October at 6pm in QUB’s Riddel Hall. A TeachMeet is an opportunity to share good practice, network, meet like minded teachers who want to see how they can integrated new ideas into their classrooms. An informal gathering of teachers and educationally interested. Previous events have been amazingly energetic for a Friday evening at the end of a working week with short, snappy presentations (2 minute and 7 minute) sharing best practice and enthusing colleagues from right across the spectrum of NI schools and organisations. And there’s a raffle, prizes for some of the talks and plenty of refreshments. Cheaper and more fun that most Continuous Professional Development!